Coming Soon: More news about the new book, "How to Talk with Anyone, Anytime, Anyplace about Anything . . . and Enjoy It. The Art of Mindful Conversation." In a small town on the west coast of Scotland, five-year-old Peter Gibb trades his soul to the devil in a futile attempt to win the approval of classmates, teachers and parents. Follow the story of Peter's humorous but desperate struggle to find a way out of the dungeons of doubt. 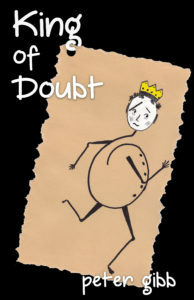 An insightful tale of lost and found, King of Doubt grips you with tension as it warms you with heart. Anyone who has ever struggled with self doubt –and who among us hasn't?–will see themselves in these pages. This moving story, one man's journey from doubt to wonder, will fill you with hope and promise. The story rivets your attention right to the final word, while the beauty of the language still sings long after the reading. King of Doubt is a testament to the power of memoir to illuminate the past, redeem its shadows, and find wisdom and strength in life’s mysteries. Beautifully written, suspenseful, and brave, Peter Gibb’s saga of self-discovery will brace you with its honesty and enrich you with its heart. Buy this book! Susan Krieger, Stanford University, author of Come,Let Me Guide You: A Life Shared with a Guide Dog and Things No Longer There: A Memoir of Losing Sight and Finding Vision. Peter Gibb has experienced well but at a cost. His memoir takes the reader through the vicissitudes of a full life from a treacherous beginning in Scotland, through an undergraduate degree at Brown, to military service, and beyond. King of Doubt, a memoir of confession and triumph, deserves every reader’s attention. The story sweeps forward with compelling intensity, in language that is detailed, humorous, and graceful. Here is a man who’s taken the road less traveled and savored it fully. "The book was incredible. Peter Gibb is so transparent, honest and forthcoming. I felt as though I was right with him every step of the way as he looked back upon his life and put the pieces together. What a gentle, caring man. Wow. And I’m so glad he put the ‘Discussion Questions' at the end! I can’t imagine anyone not responding positively to this amazing book."